I've been loving having FOUR DAYS OFF! Whoooo hooo. I haven't accomplished a single task that I wanted to do but whatever. For Thanksgiving I bought a huge bag of Rhodes Texas dinner rolls. I forgot to thaw them and have them rise in time for dinner so.... I saw you could make Fry Bread out of them. I've been jonesing for fry bread tacos lately and really, haven't felt like making the dough from scratch. It's not hard to do but I figured I could try it out using bread roll dough. 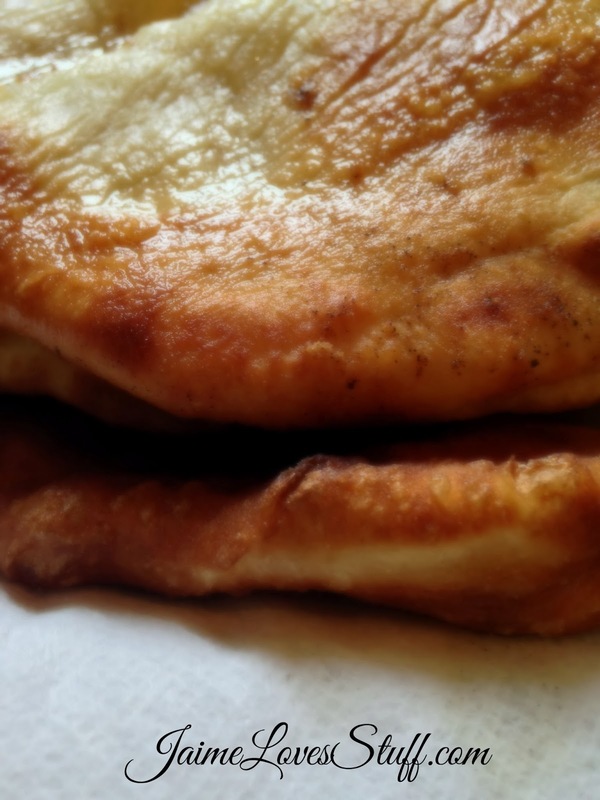 I use them to make bierochs, so it can't hurt to turn them into Native fry bread tacos. Honestly, I thought they came out really good. Not as great as made from scratch and fried in Crisco but it was doable. I ate a few and Emma ate a few. I call that a win-win. Although the rolls are large, they do make kind of small tacos. I think next time, I'll use two balls of dough for one fry bread. What can I say? I'm a pig and am used to huge ones. Follow the directions on the bag of rolls in regards to defrosting them and allowing them to rise. Flour a counter/wood board/whatever and rollout the dough the a good size that you like. Make sure your oil is nice and hot and fry each bread up until a nice golden, crispy. I used a small skillet but you could use a sauce pan, fry daddy, whatever and be fine. I made Cafe Rio Chicken and cilantro lime rice. Recipes are here. Top with your favorite toppings. I like lettuce, cheese, tomatos, beans, guacamole (or just avocado), sour cream, and salsa. I'd totally make this again. Easy peasy.